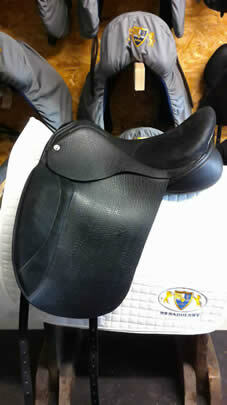 The Matrix is a fully customizable Dressage Saddle specially made for the younger rider or smaller adult. It is made in Buffalo leather on a traditional wood sprung tree. It features a full V Billet system, front gusset and Velcro blocks in 2 sizes. The block position can be adjusted as the rider develops and grows. As with all our saddles the tree size can be adjusted as the horse or pony changes. 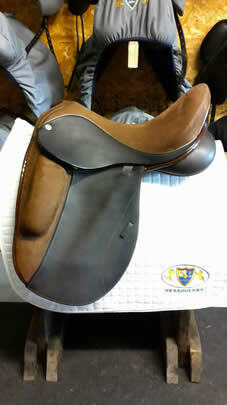 If or when the rider outgrows the saddle we will trade the saddle in against a new full size dressage saddle. The Cardhu, a true monoflap, accomodates a variety of horses. It has a higher head, deep seat, and contains a larger panel area for comfort.Our riders tell us the deep seat is very comfortable because it gives them a secure feeling in the saddle. 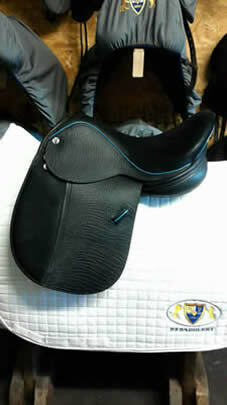 This saddle is made with buffalo leather, Mykela leather on the seat, and a nice grippy goat leather on the knee roll. GS is built on a fairly flat tree, so it’s good for horses that have a flatter back. It comes with a gusset, so it can also accommodate some wither. It has a flatter seat that provides the rider with a nice secure feeling. GS comes standard with Buffalo leather, Makela leather seat, and Makela leather over the knee block’s molded flap. This saddle has the London Welt. Luminoso is built on a curvier tree, but has a bit more of an open seat and a nice large knee roll. 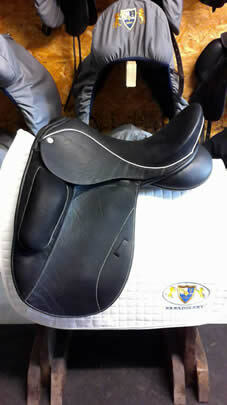 A very comfortable saddle, it fits a variety of horses and is also very good for young horses. Without being too constricted, the saddle provides the rider with a nice secure feeling. The Vincitore, a true monoflap, was designed to provide more room for the horse's trapezius area, around the wither, and the base of the wither. The fairly curvy tree fits a variety of horses, and the saddles gullets space is a bit wider, so it works perfectly on most horses as well as on wider horses. It is made with buffalo leather and Makela leather on the seat and knee roll. 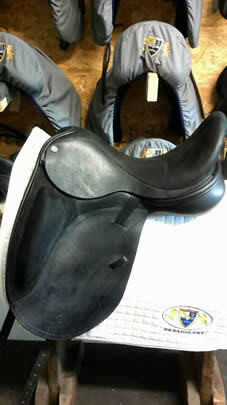 This particular saddle has a short block with white welt and stitching and a black patent cantle. It is gorgeous!. The Vincitore, a true monoflap, was designed to provide more room for the horse's trapezius area, around the wither, and the base of the wither. The fairly curvy tree fits a variety of horses, and the saddles gullets space is a bit wider, so it works perfectly on most horses as well as on wider horses. It is made with buffalo leather and Makela leather on the seat and knee roll. This saddle has been upgraded with gold welt, patent brown facing on front and rear and cantle, and brown buffalo leather. Short knee roll to acommodate many different sized riders. Pictures don't do this saddle justice! Don't see what you're looking for? 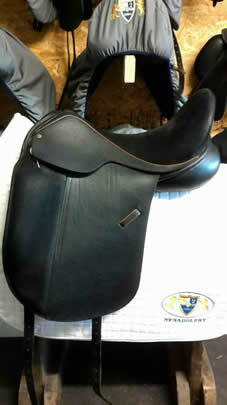 A new Custom, N2, or Black Country saddle can be ordered to your specifications. Contact us for more details. If your new saddle will be replacing an existing saddle that you'd like to sell, please take a look at our consignment services.